As we enter into this new year let us seek His yoke in terms of our own individual purpose and calling. If we have asked Jesus to bind us to His purpose and to loose us from the snares and plans of the enemy then what is that doing in our lives? I started this short series with the verses below. This shaping process begins to unveil our calling and purpose. Very few of us will have a blinding light like Paul on the road to Damascus, or Mary having Gabriel appear and speak to her. Many of us may not even have prophetic dreams. Yet as we positon our hearts before Him in the place of humility we will hear His voice in our hearts. It may be a sense of direction or purpose, it may be a scripture verse or passage that comes alive to us, yet whatever it is faith will be required. Generally what we are called to will look different than what we expect. I am now quite comfortable speaking before large or small groups. Yet even though I had a sense of a desire to teach while in high school I don’t recall connecting the dots that it meant speaking in front of groups of people! Strange but true. I had a desire to teach but no desire to be in front of groups of people. My point being that something in me was responding to my calling but later in life it meant taking risks and stepping out in faith to actually do it. I remember my first sermon, with no practice ones, in front of a small group and my next one in front of three to four hundred people. I remember how I felt, anxiety being the key descriptor. Yet following Jesus meant doing something in spite of how I felt, not because of it. When I started writing teaching in the 90’s I don’t think I was that good. My writing has improved a great deal over the years. Not through some magical download, but through hard work, getting feedback on my writing, some of it painful to receive, and making changes. Much of this has taken place in the context of my work. Jesus using my job to deepen my gifts for ministry. In the end, whatever our gifts and calling are, Jesus wants to reveal some aspect of Himself through us. Seeing it happen means cooperating with Him to develop our gifts. The next area I want to talk about in relation to yokes is the role in our prayer lives. To do that I want to look at a scripture and share an experience I had in September of 1990. I was at the Vineyard Holiness conference at the Agricom in Edmonton. There were about 4,000 people there and while waiting for the evening session I was in the lobby area speaking with someone I knew and waiting for my wife. A lady approached us and said to me, “Excuse me, I don’t know if you noticed but I have been staring at you all day. Every time I look at you I see you with a Jewish skullcap, a long white beard and a big empty book in front of you. The Lord said to tell you he is going to fill the book and to give you Leviticus chapter 8.” The cap she referred to was a yarmulke, the small round Jewish cap. Being deeply aware and spiritually astute I obviously asked the lady a bit about herself and immediately read Leviticus chapter 8. Actually no, I never knew her name and would not have recognized her if I saw her on the street the next day. The important piece was the message rather than the messenger. Something we would do well to remember as His servants. I did not read Leviticus 8 until I went home later that night and even then didn’t get much out of it. I have no question the word was from the Holy Spirit and my understanding of the application has continued to grow over the past 26 years. I deeply appreciate that this lady listened to the Holy Spirit and took a risk and shared with me and I would now appreciate the opportunity to speak with her about what she shared. I still don’t have a long white beard and suspect I never will. However that part of the message was about an image representing age, maturity and wisdom. So what is important about Leviticus 8? Many things, but for our purposes 8:8. This doesn’t tell us much, it requires having scripture interpret scripture. Exodus 28:15-21 does that for us. I will share the first and last verse of the passage. Putting these verse together we know from Leviticus 8:8 that the Urim and the Thummim were in the breastplate, that it is a breastplate of judgment. This was judgment in the sense of governing or deciding. We also know the breastplate had twelve stones on it, one for each of the twelve tribes of Israel. I have long believed that the Urim and the Thummim correspond to the wisdom and revelation of Ephesians 1:17. We need spiritual wisdom and revelation to judge wisely. When the high priest entered Yahweh’s presence he carried the nation over his heart in an act of intercession, as represented by the 12 different stones. In a similar manner we are called to carry certain individuals, groups or other things over our hearts into His presence when we intercede. We are likely all familiar with the concept of the Lord ‘laying something on our heart.’ This is how we apply it. Standing in the place of intercession for others is a yoke He offers to all. Not many accept this yoke. Taking it doesn’t mean we need to become a fulltime intercessor. It does mean we commit to respond when He touches one of the stones upon our heart. Do you know what stones He has asked you to carry? Are you responding when He touches one? Ask Him to reveal what He desires you to carry and to be sensitive to His touch upon them. As we prepare for a new year how many of us could use rest for our souls? Most of us I suspect. So, experientially how do we get to that place of our soul functioning from rest or being at rest? The easy answer is that we simply come to Jesus. After all that is what He instructed. There is as usual a ‘however.’ Jesus said if we come to Him then He will bring us to a place of rest. The however is that this rest is conditional upon taking His yoke. I will explore and explain what that means and explain the role of ‘binding and loosing’ in connection to Jesus yoke. Another area I will address is the role of the High Priest carrying the nation on His heart when he went into the Holy of Holies and the present day application in our lives. So now that I hopefully have your attention. What does it mean to take Jesus yoke? There are a couple of applications. One is the idea of training a new ox by yoking it to an old ox. 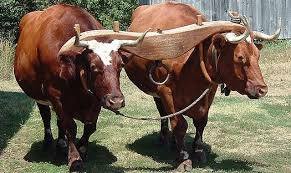 See the picture below of two oxen yoked together. The concept of yoking the old ox to the young ox is that the old ox would train the young ox around when to pull and stop; when to turn and so on. If the young ox pulled against the yoke it would eventually learn to submit to the older ox or be continually frustrated. In Jesus day being under someone’s yoke meant being their disciple. For example Paul was viewed as having taken the yoke of Gamaliel because he was Paul’s primary teacher and Paul (Saul at the time) was his disciple. Jesus was in effect saying become my disciple and allow me to train you and I will teach you to walk in and live from rest (see Heb. 4:1-13). What does it mean in practice to be discipled by Jesus, to take His yoke? First it means we can’t have other yokes. Look again at the image of the oxen. What would it be like to have another yoke attached to another animal and pulling in another direction? Rest would not be the first response! Yet that is what I think most of us in the church have done. What are some ‘other’ yokes that are pulling at us? The first response may be to consider obvious sins. However, what about the yoke of human expectations? The yoke of the pressure to be ‘successful.’ The yoke of pleasing others? These are examples of things that keep us from true rest. Paul addressed this clearly and he was so effective in his ministry because he only had one yoke. Some of the other yokes pulling at us are the result of both the secular and church cultures around us, and of course our responses to it, yet many of these yokes are internal, rooted in our own fears, insecurities and unwillingness to lay down our own agendas. What would our Sunday services look like if in actuality our only agenda was pursuing His heart and releasing His life to others? A little different than most services I think! Is this different than what you thought? Most teaching on ‘binding and loosing’ focuses on trying to bind the enemy and loose or set people free. While that is an application of Matthew 16:19 below (see also Matt. 18:18-20) we can also turn this around as in the Song of Solomon and seeing what Paul spoke in the verse below. So, as we prepare for a new year may we also pray that we are prepared for His purpose by breaking off wrong yokes and praying that our minds will be renewed to take only His yoke. To truly be Jesus disciples. My basic contention, which I have shared with many over the years, is that the salvation and sanctification of our spirit is instantaneous at conversion. We receive Jesus life in our spirit (2 Cor. 5:17). For our body it will also be instantaneous, either when we are resurrected or transformed if we are alive on the earth at Jesus return (1 Thess. 4:13-17). However the salvation and sanctification of our souls however is a process (Jas. 1:18-21). I will come back to this later. To understand the distinction between spirit and soul it is helpful to lay a scriptural foundation. The scriptures below teach that there is a distinction. 1 Thessalonians tells us there is a distinction between our spirit and soul and Hebrews tells us that while it is difficult, we can understand the distinction by applying His word. The verse below tells us we only need two or three witnesses to establish the truth of something, in this case the truth that spirit and soul are not the same thing has two witnesses above. While the two witnesses above are sufficient, according to scripture, when we actually apply Heb. 4:12 in practice the spirit and soul distinction become clearer. My qualifier is that I use a bible that is more literal in translation because much is lost in the translations that use more of a dynamic equivalence or paraphrase. This is clearer in the verses below. The tense in the NKJV and the other more literal translations is important. For example the same two verses in the NIV do not clearly bring out the different functions of the soul and spirit. The important distinction lies in the tenses, particularly in the Luke passage. Something is released by our soul after it has already happened in our spirit. Isaiah speaks of his soul desiring something but using his spirit to encounter Yahweh. Mary tells us that her soul magnifies Yahweh because, past tense, her spirit has already rejoiced in an encounter with Him. I believe that our soul has three aspects, it expresses our mind, will and emotions. Similarly I believe our spirit has three functions, conscience, communion and intuition. The verses above speak of the result of Isaiah and Mary experiencing or desiring communion in their spirits. So, back to repentance and sanctification. The task of seeing Christ formed in us is accomplished by submitting the desires of our soul to the leading of our spirit, the place where Christ dwells within ever true believer. Peter, a man who had more than a little experience with this said it well. Our souls are sanctified when we repent of whatever He reveals to us in our spirits. What we carry from time into eternity is the degree to which the nature of Jesus has been formed in our souls (Gal. 4:19). The question is how our formation is going?